Adult people all over Japan had been captivated by 20th Century Expo, theme parks that reenacted good old days of the 1970s (the last days of Japan's high economic growth). One day the adults disappeared into the theme parks, leaving their children abandoned. That was a plot by 'Yesterday Once More', an organization who despises the 21st century and tries to bring Japan back to the 20th century with the dreams and hopes. Shinnosuke and his parents, Hiroshi and Misae, fight against the plot of 'Yesterday Once More' in order to live together with family in the 21st century. There is no greater love in this world than the love of your family. I'm not exactly going to review this anime. Let me just say two things, and I'll list out some quotes from the movie, and I'll be done. 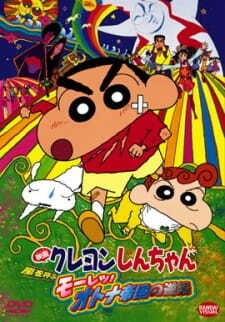 First, this movie made me realize that crayon shin-chan isn't just for kids. Second, some animes in the world may have mediocre story, mediocre art, mediocre sound, but may deserve no less than a 10/10. These are quotes by Nohara Hiroshi. "Those who believe they have gotten big have no right to be big." "The antonym for justice isn't evil, but another justice." "My life isn't not interesting! I almost want to share the happiness of having a family!" "Like I'd have any regrets on a world without Shinnosuke!" "We aren't heroes who save the world. We are fathers who want future for their children." "I'm never letting you go again, Shiro, Shinnosuke. Never again." "It isn't life if it goes as planned." "There are no parents who tell their kids to die!" "There are people who can work for me, but there are no replacements for father." "No matter what happens to my body, I protect my family!" "Idiot! It's admonishing, not educating! There is no point if you don't do it yourself!" Shinnosuke is still the same ol' perverted kid in this movie. The story begins of nice, Shinnosuke and his family star in this action movie where his Dad plays a parody superhero. (Parody of Ultraman.). After this it just continues normally, everyone we basically know from the normal series is at the World Fair's 20th Century Museum, where all the parents try to relieve they're childhood. As they are about to enter the 21st century, a certain evildoer hypnotizes adults via tv, thr...ough a 20th Century Museum commercial, this turns the adults in childs, not psysically, but mentally. This shows that Shinnosuke can be very mature, and yet.. not. So the story's pretty plain, but the way it is shown in this movie it's just great. They still use the same weird art style, which is just needed in Crayon Shin-Chan series/movies, specials and such. So I'll give it a good score. The sounds okay too. The characters, of course, Shinnosuke is still the same ol' perverted kid, which I said before. Furthermore he still has those crazy moods and actions. Shinnosuke's friend group is just as crazy as normally, especially when they get drunk on Oolong Tea. You can see they're mature side which you don't see very often, yet they can act as baby's the next moment. If you're ready for a bit extraordinary artstyle, alot of humor and a funny adventure. This movie is where you need to be. I recommend that you'd watch (a bit) of the series, &quot;Crayon Shin-Chan&quot;, just so you get to know the characters and minor characters a bit. But it's highly enjoyable, even to watch it several times. It certainly is an epiphany when you find out that the crudely dubbed show you used to watch on television (Shin-chan has been airing in India for quite a few years now, in Hindi) and which, apparently, is exclusively aimed at kids, is much deeper and inspiring than it appears. I can't speak for the other movies in this franchise, but this one certainly was. The basic plot element, in one word, would be 'nostalgia.' Keeping spoilers to the minimum, the movie is about the circumstances that'd arise if adults were suddenly provided with the golden age of their childhood, the period they were brought up in, cheerful and gloomy moments alike, and the opportunity to live in it forever; and how our main cast struggles their way through it to earn their anticipated outcome. Despite the seriousness of the plot, the film is thoroughly light-hearted and comical, as in accordance with the minimalistic art-style that keeps it apart from the rest of the medium as well as the misadventures of our eternally young 5 year old protagonist and his friends. That's why even the bus-chase that is over 10 minutes long, or the pointless acrobatics above the Tokyo tower never feels overbearing but makes the emotional moments even more captivating. The movie also doesn't miss out on inserting some social commentaries in between, which are gleefully lost among the puns and parodies. The story has a villain, or two to be precise, but they're portrayed as justice against justice rather than evil, and are on the softer side when it comes to implementation of violence to achieve their means, which gives them that humane touch that prototypical villains lack. As already mentioned, the art is crude, as is the comedy, but it perfectly contributes to the overall feel of it. And it'd be a real shame to skip this one based on preference of visuals alone. Because here is something that has the colour of a sunset, joyously defies serious scrutiny should one even attempt it, and at the same time is culturally profound from a Japanese point of view, from the very first mahou-shoujo anime televised, right down to Taro Okamoto's avant-garde art and an escapist society of the early 21st century.